The Roboard RB-100 is a new breed of robotics controller: a fusion of a traditional microcontroller and a full function computer. 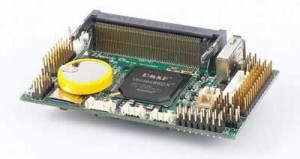 Think of it as an OS capable microcontroller on steroids, boasting a 32bit x86 CPU running at 1000MHz and 256MB DRAM. The ability to load an operating system of your choice and have direct access to I/O, Comm ports, USB, and networking opens this controller up to a wide range of robotics based applications. Our Roboard Starter Kit comes with just about everything you need to implement this feature rich controller in your next robotics project! All you need to supply is a 1-2gb Micro-SD card to load an OS onto, 6-24v, and a robot!